ePosters - Blinded Comparison of an [i]in vitro[/i] Diagnostic NGS Assay with Sanger Sequencing for HIV Genotypic Resistance Testing. 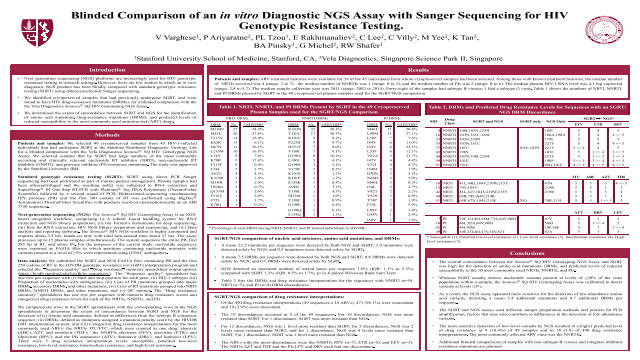 Poster Title: Blinded Comparison of an in vitro Diagnostic NGS Assay with Sanger Sequencing for HIV Genotypic Resistance Testing. Abstract: Next generation sequencing (NGS) platforms are increasingly used for HIV genotypic resistance testing in research settings. However, there are few studies in which an in vitro diagnostic NGS product has been blindly compared with standard genotypic resistance testing (SGRT) using dideoxynucleotide Sanger sequencing. We identified cryopreserved samples that had previously undergone SGRT, and were found to have HIV drug-resistance mutations (DRMs), for a blinded comparison with the the Vela Diagnostics Sentosa SQ HIV Genotyping NGS Assay.